If you’re a parent, relative, caregiver, therapist, or teacher looking for meaningful autism tattoos to help raise autism awareness, you’ve come to the right place. From basic puzzle piece tattoo and autism ribbon tattoo ideas, to inspiring autism tattoos for mothers and fathers, to unique autism tattoos that aren’t a puzzle piece, we’ve rounded up 79 beautiful tattoo designs you’ll love. What Does the Puzzle Piece Represent for Autism? 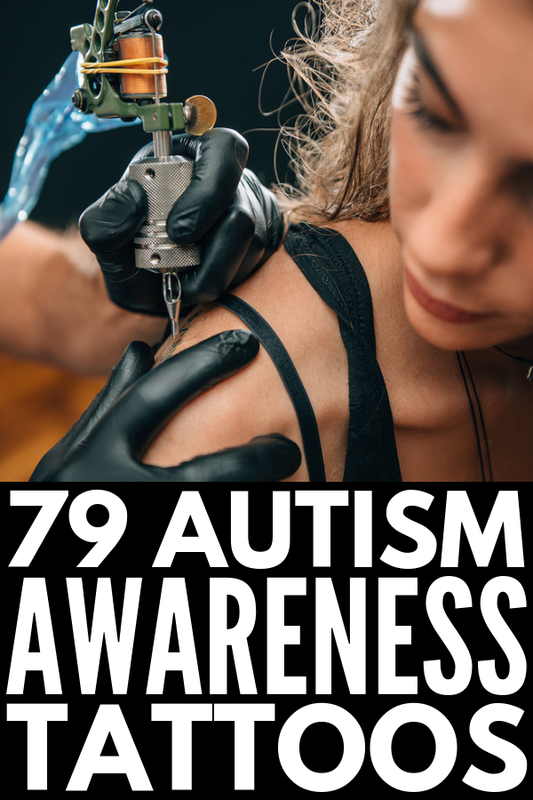 If you’ve spent any time on Google or Pinterest researching autism tattoos, you’ve probably noticed that most designs incorporate a puzzle piece in some way, shape, or form, which causes a whole mix of emotions in the autism community. The puzzle piece was first used to represent autism in 1963 when The National Autistic Society chose a green and black puzzle piece with a weeping child inside of it as their logo. They have since publicly acknowledged that the puzzle piece was chosen simply because it did not look like the logos of any other charitable organizations at that time, while also confirming the puzzle piece and weeping child were meant to represent the fact that children with autism ‘are handicapped by a puzzling condition’ and as ‘a reminder that autistic people do indeed suffer from their handicap’. The National Autistic Society has since changed its logo, but the Autism Society adopted the puzzle ribbon as the universal sign of autism awareness in 1999, and the logo for Autism Speaks – a controversial autism charity – is a blue puzzle piece. Both of these logos continue to illicit negative feelings among those in the autism community. While some people view the puzzle piece as a representation of the complexity and diversity of individuals with autism, others feel it implies people on the autism spectrum are ‘missing’ something and need to be fixed. Whether you support the use of the puzzle piece to represent autism, or prefer to find other ways to raise awesome awareness, this collection of 79 meaningful autism tattoos is sure to inspire you. A round-up of autism tattoos wouldn’t be complete without a collection of puzzle piece designs, and I love the unique and creative ways others have used this universal symbol to represent their love for someone on the autism spectrum. If you find a traditional puzzle piece to be a little too controversial as it relates to autism awareness, but like that the autism ribbon is designed to reflect the complexity surrounding autism and symbolize hope, these autism ribbon tattoo ideas might be for you. Autism moms are warriors. I’m serious! They live a stressful, unpredictable life in which they must watch the people they love the most struggle in ways they can only imagine, and while they’re desperately finding ways to give their children a better life, they must do it in an unaccepting world filled with judgment and unsolicited advice. And while not for everyone, autism tattoos can often be cathartic, providing autism moms (and dads) a way to show the world the undying love and dedication they have for their child. Autism dads deserve a special shout-out too! Whether they’re there for all of the day-to-day stuff, like driving to and from therapy sessions, enduring IEP meetings, and juggling specialist appointments, or miss out on all of those things while they’re slugging away at the office each day earning the money needed to pay for all of these things, the crucial role they play cannot be forgotten, and a little ink can go a long way in helping the world catch a glimpse into their hearts. Wrist tattoos have gained significant popularity in recent years, and I’ve always loved how simple and personal you can make them, and how visible they are not only to the world at large, but to the individual who ‘wears’ them. Whether you choose a design, a word, a quote, or a poem, a wrist tattoo is something you will see multiple times a day, so make sure you choose something meaningful! If you’re not a fan of using a puzzle piece to represent autism and/or you’re looking for inspirational autism tattoos to better represent what it’s like to be the mother, father, relative, caregiver, therapist, and/or teacher to someone on the autism spectrum, these autism tattoos that AREN’T a puzzle piece won’t disappoint. I tried to find a mix of different ideas – designs that represent the undying love you feel toward your child, words that remind you to keep moving forward when times are hard, reminders to live in the moment, and beyond – and hope you find a little inspiration in what I’ve shared below. If you liked this collection of autism tattoos, please share this post on Pinterest! And if you’re looking for more autism-related advice, please follow our Special Needs board where we share all kinds of great ideas we find each day.